Sold by T.MarieBookseller and Fulfilled by Amazon. Gift-wrap available. Comment: May show some signs of wear including creases, scuffs, highlighting, or writing. Ships direct from Amazon! Recorded history is a finely-woven magic fabric of intricate lies about events predating the sixteenth century. There is not a single piece of evidence that can be reliably and independently traced back earlier than the eleventh century. This book details events that are substantiated by hard facts and logic, and validated by new astronomical research and statistical analysis of ancient sources. Sold by T.MarieBookseller and ships from Amazon Fulfillment. Sold by True Timeline and ships from Amazon Fulfillment. Sold by Life Science. and ships from Amazon Fulfillment. 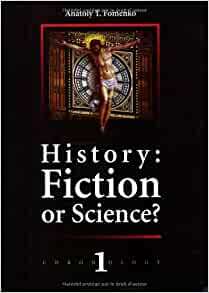 "History: Fiction or Science?" 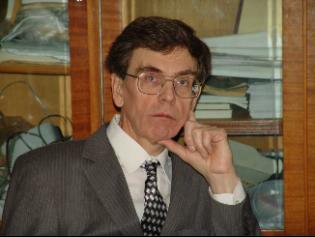 crowns 30 years of meticulous and extensive research performed by the eminent mathematician Anatoly Fomenko and his colleagues. This research started in fact as a unbelievable byproduct of russian-american competition in Moon exploration, when famous NASA scientist Robert Newton discovered a very strange phenomenon in lunar mechanics. This book is also the first volume in seven comprising "Chronology", the fundamental oeuvre that exposes and expounds the numerous inveracities of the traditional version of history. 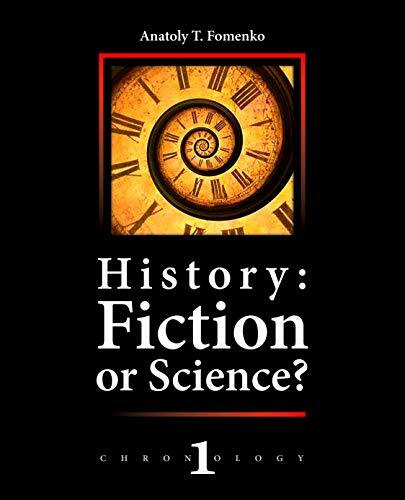 "History: Fiction or Science?" contains data and conclusions that arent anything short of revolutionary. The alternatives offered to classical history are stunning, unorthodox to the extent of being labelled heretical by virtually every scholar of history, and daring enough to be considered preposterous at first sight, although this impression never lasts longer than it takes one to read a few pages attentively. In chapter I we are reminded of when the contemporary chronological scale was created and by whom, with the culprits named as the XVI-XVII century clergy that was in charge of all matters historical in that age. We also learn that the consensual model of history had prominent critics ever since its creation  among them such names as Sir Isaac Newton and Jean Hardouin, chief librarian of Louis XIV, the Sun King of France. The author dissects every historical age and analyses the data from every source imaginable  Roman and Egyptian chronology take a good beating, and it goes rapidly downhill from there. Poggio Bracciolini and Petrarch take the blame for creating the legend of a mythical Classical age that never was. The Biblical events are moved a lot closer to us historically, as well as geographically (the Biblical Jerusalem being identified with the mediaeval Constantinople, for instance). The New and the Old Testament swap their positions on the chronological scale, both exposed as referring to mediaeval events. Our perception of history changes dramatically even before were through with chapter I. In chapters II, III and IV the author summons astronomy and statistics to provide proof for his theories, which the latter yield gladly and abundantly, and we discover that our amazement resource was by no means used up in the previous chapter. Apparently, there is some vary valid astronomical proof for the authors theories in the ancient Egyptian zodiacs, Ptolemys Almagest, and the Biblical Book of Revelation. Chapters V and VI contain in-depth descriptions of the methods used by the author as well as the most meticulous rendition of the global chronological map with its numerous errors and glitches explained in a very level-headed manner  one doesnt have to be a mathematician to understand, but a great deal of common sense is required for that purpose. Finally, in chapter VII we learn more about Antiquity and the Middle Ages, and how the division between the two exists in our mind only (which is a hard concept to accept, even though we familiarize ourselves with it at the beginning of the book). If this isnt enough, the appendices contain all sorts of factual information to appease the sceptics as well as provide fresh New Chronology converts with deadly ammunition for keeping the critics well at bay. and possibly also for those who are. Dear prospective Reader, we have the pleasure to invite You to use the 'Search Inside' feature to acquaint Youself with the book. Start reading History on your Kindle in under a minute. Very dense. You really have to know your stuff to get through this book. Honestly, if you can read this book and understand it from a math standpoint, well then you are set. History knowledge is no good for this book. Fomenko's whole theory is based on astronomy, the movement of the moon, gravitational forces, gravitational pulls, etc.. Fomenko uses mathematics to explain inconsistencies! So if you know at least something about math and science, enough to understand the fundamental workings of space, well then this book is for you. It is not really for "history buffs" since they are the first to cry malarky! presumably, because they don't get the science behind it. It is not a dig, that's just not the field they are in. Besides, imagine spending your life learning history just to be told you are wrong - doesn't sit well with some people. The book is supposed to be thought provoking. Fomenko is not claiming he is right in any way, he is presenting patterns and inconsistencies in history that he started studying after trying to compute coefficient D in the theory of Lunar Motion when he was studying celestial mechanics. He needed the dates of ancient eclipses, for which he used historical documents to figure out. He found a leap in the interval of the 5th to 10th century. That is how the chronicles begin. The guy wrote 7 books about the subject and spent decades researching the topics. There is so much information in this book, that it might take the smartest person years to dig through. So again, if you have an open mind and want to look at history through the math/science lens, then this book is definitely for you! Reviews have been written. This post details my impressions after reading Volumes I and II. Fomenko's research does not in fact provide a new understanding of history for me, a new veil to adopt as reality. Rather, it pulls aside the old veil of "established" history and leaves a breathtaking open field. In that openness, with the veil which has heretofore served as reality, ripped aside, there are questions begging for answers. What DID happen before the XVI-XIX centuries (possibly - and I hope - to be answered in other of his texts, such as that regarding Russian Tartary or the problems of Chronology)? A more fundamental question to be answered is, if we have been so easily duped by numbers - in this case, dates - what else are we being duped about? What is the next veil to be pulled aside? What is the nature of time? Einstein is quoted, "... us physicists believe the separation between past, present, and future is only an illusion, although a convincing one." Fomenko's work provides answers that lead to more questions. The journey is stimulating. Enlightening, too, but as we move, as it were, we pass under one streetlight into the night. What is the next streetlight that will show the ground beneath our feet and hasten us further on our journey? Since we're talking here about chronology, my mind turns to the mythical "Chronos," which may represent the reality of time as we experience it, the fourth dimension. Meanwhile, perhaps "Kronus" is the counterfeit, the falsification. Fomenko points toward the reality and exposes the falsification. Perhaps the "real" cannot be expressed in words; however, the false can be identified and exposed, thus furthering the quest. I welcome any such furtherance. Very dense. You really have to know your stuff to get through this book. Honestly, if you can read this book and understand it from a math standpoint, well then you are set. History knowledge is no good for this book. Fomenko's whole theory is based on astronomy, the movement of the moon, gravitational forces, gravitational pulls, etc.. Fomenko uses mathematics to explain inconsistencies! So if you know at least something about math and science, enough to understand the fundamental workings of space, well then this book is for you. It is not really for "history buffs" since they are the first to cry malarky! presumably, because they don't get the science behind it. It is not a dig, that's just not the field they are in. Besides, imagine spending your life learning history just to be told you are wrong - doesn't sit well with some people. The book is supposed to be thought provoking. Fomenko is not claiming he is right in any way, he is presenting patterns and inconsistencies in history that he started studying after trying to compute coefficient D in the theory of Lunar Motion when he was studying celestial mechanics. He needed the dates of ancient eclipses, for which he used historical documents to figure out. He found a leap in the interval of the 5th to 10th century. That is how the chronicles begin. The guy wrote 7 books about the subject and spent decades researching the topics, so I am sorry, but to disprove his claims, you also have to approach it from a math/ science standpoint. There is so much information in this book, that it might take the smartest person years to dig through. So again, if you have an open mind and want to look at history through the math/science lens, then this book is definitely for you!